As I’ve mentioned previously, the majority of Brazilian beers are macrobrewed and labelled as Pilseners – albeit watery and quite bland. However, Brazil’s burgeoning microbreweries are increasingly introducing a wide variety of styles and flavours to the market. One style in particular that I’ve enjoyed recently is Rauchbier – a smoky lager that originates from Bamberg in Germany. Its smoky flavour comes from the drying of malt (one of beer’s key ingredients) over open flames before its use in the production of the beer. At last week’s first ever Brazilian Beer Competition in Blumenau, two Rauchbiers were adjudged to be Brazil’s best smokey beers, and by chance I happened to have one of each in my fridge! Where purchased:Bamberg Express (São Paulo). Background: The Bamberg micrbrewery was opened by three brothers in 2005 in Votorantim near Sorocaba, São Paulo. The brothers had visited several breweries around the world, and after much research founded the brewery under the name of Bamberg – in honour of the German city with its own famous brewing history (and also the home of Rauchbier). Bamberg brews its beers according to the 1516 German law of purity, which states that only water, hops and malt should make up the ingredients of beer. 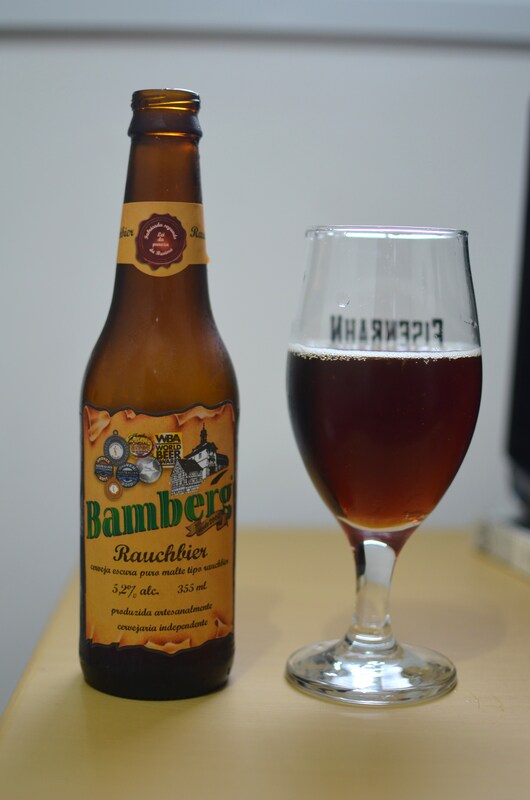 Bamberg’s Rauchbier pours a dark amber body with a slight, off -white head. A heavy smokey flavour completely dominates and lingers at the back of the mouth – reminiscent of the heavy smoky smell that lingers in your nostrels when you stand next to a bonfire! So, if Bamberg won silver, who got the gold? Where purchased: Bourbon Shopping (although available pretty readily in São Paulo). Background: See my feature on Eisenbahn here. Like Bamberg, Eisenbahn brews its beers according to the German law of purity. 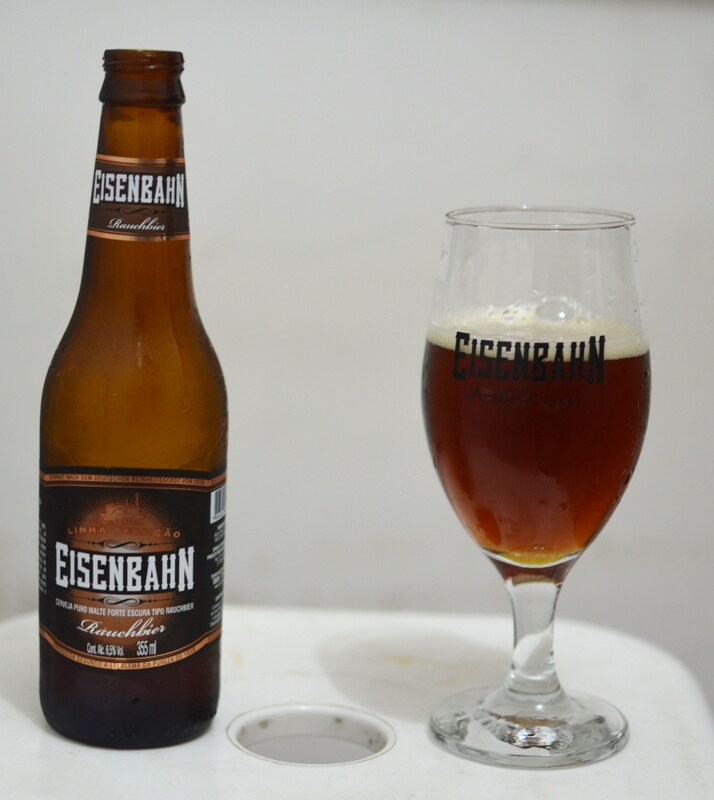 Similar to the the Bamberg, the Eisenbahn Rauchbier pours a dark amber colour (slightly lighter than the Bamberg), with a short-lived off-white head. The Eisenbahn’s smokey taste is a little more subtle than the Bamberg’s, and of the two is slightly smoother to drink. the book is on the table’s Conclusion: I wouldn’t say there’s much between them, but if you’re looking for the beer with the more overwhelmingly smoky flavour, go for the Bamberg. At a cheaper price and a higher percentage of alcohol the Eisenbahn is probably better ‘value for money’, although as they’re owned by Schincariol you’d expect them to have the extra financial clout to be able to undercut their rivals. Nevertheless, both are decent beers and should be on your ‘to try’ list.